Chinchillas came from high up in the Andes Mountains of South America in Peru, Chile, and Bolivia. Wild Chinchilla colonies were hunted almost to extinction during the 1800s. In the beginning of the 20th century the South American governments passed laws banning the hunting of Chinchillas. In terms of habitat erosion Chinchillas are still endangered. Nowadays they can only be found in the mountains of Bolivia at elevations of 3,000-12,000 feet, a chinchilla eats roots, grasses, grains, bark, fruits, bulbs, leaves, stalks, seeds and nuts. Chinchillas teeth grow throughout their life and must be worn down. 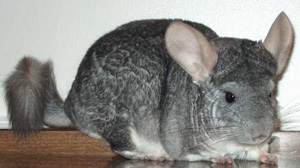 Chinchillas are low maintenance and have no foul odors if maintained properly. Housing your chinchilla: Provide the largest cage possible for your chinchilla. A minimum size appropriate would be around 3 feet by 2 feet by 2 feet. Galvanized wire cages are good (plastic will be chewed to bits), with mesh small enough to keep your chin's feet from slipping through. Solid floors are best for your animal's feet, but must be cleaned daily. Wire bottomed cages (the most common) can be cleaned weekly, but place wooden platforms placed over some parts of the wire to allow your chin a solid floor to move to. The "condos" with multiple levels and platforms are ideal, because they offer more usable floor space and allow your chinchilla some room to climb. A pull out tray under each level will make cleaning easier, and should be filled with a dustless absorbent litter, such as aspen shavings or paper-based commercial bedding - do not use cedar shavings as this can be toxic to your chin. Pine shavings or chips is a good choice if it is kiln dried. This process removes the irritating oils that can cause problems for the animal. Corn cob bedding is great for some pets but not for chinchillas. They will eat this bedding and it can cause bloating, constipation and obesity possibly to the point of death If your cage doesn't have platforms for climbing, a sturdy branch or other climbing toy should be provided. You should also give your pet a hide box or cave for inside its cage. This will give your pet a secure place to hide when it wants to sleep or feels upset. Wooden ones are most common because they offer more chewing material, but they may need to be replaced regularly if they can't be cleaned properly. The entire cage and all accessories should be cleaned weekly, or more often if needed. Disinfection should be a monthly task, or after an illness. Cage Location: The chinchilla cage should be located in a quiet part of your house. It should have good ventilation, be free of hot and cold drafts, and be away from direct sunlight and other heat sources. Because of their thick fur, and mountainous native climates, chinchillas are susceptible to overheating in captivity. The best temperature for your pet is 60 to 75 degrees Fahrenheit, which is typically room temperature. Chinchillas will not thrive above 78 degrees or in humidity over 40%. Keep in mind that anything on or near the cage has the possibility of being chewed and eaten, so keep things like curtains, cage cleaning supplies, and electrical cords at least 12 inches away from the cage. Diet & Feeding: Chinchillas are herbivores. The best food for your chinchilla is a commercially made chinchilla pellet diet (not rabbits or other mammals). It can be found in the small mammal section of almost any pet store. Also provide constant access to timothy and alfalfa hay, which can also be found where other small mammal foods are sold. Food containers and a hayrack that attach to the side of the cage will keep both from getting soiled on the bottom of the cage. Any regular food dishes should be cleaned daily, or more often if used as a toilet. Adult chinchillas can be given treats in small amounts. Ideal treats include a few raisins, small chunks of apple, bits of lettuce etc. Avoid high-fat treats like nuts or seeds, and limit fruits to special occasions they are high in sugar. Fresh water should be provided at all times in a drip-free, water bottle with a stainless steel spout. Clean the water bottle regularly to keep bacteria from getting into the water. Toys Chinchillas love to chew, and will try to chew on just about anything they can get their mouth on. So for entertainment, as well as to keep their teeth short and healthy, your chinchilla will need plenty of chew toys. Wooden toys made for rodents or birds will work well. There is also special "chinchilla block" or pumice stone that can be used and will help keep its teeth in shape. There are also toys that will encourage exercise for your chin. For example, you may try a running wheel in the cage. The wheel should be of the 15 inch size, and should have a solid bottom (not wire). There are also large plastic running balls that you put your pet inside and allow for safer running in the house. These must have plenty of ventilation holes, and should be kept away from stairs and other pets (who might try to play with the ball). Dust Bath To clean themselves, chinchillas will roll around in a container of dust, which removes excess oil and dirt from their fur. 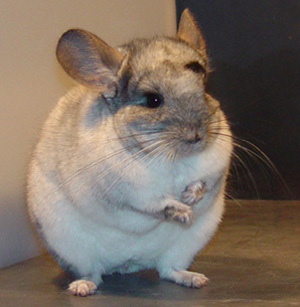 You will need to provide a container large enough for your chin to roll in, and a special dust made just for chinchillas. Do not try to substitute with another type of powder or sand. Chinchilla dust can be bought in most good pet stores. Fill the container with about two inches of dust and let them go. If you have more than one chinchilla, provide each one with its own dust tray to prevent the spread of illness or bacteria. Give your chin a bath once or twice a week, and remove the dust tray when he or she is done. Handling & Exercise While many chinchillas don't care for too much handling, interaction is important for healthy bonding. You may even find your pet to be a little demanding, which is why some people buy two or more. When playing with your chin, you must be very gentle. Chinchillas are very delicate, and their fluffy fir sometimes make it difficult to know how hard to grab. Only hold your chinchilla by the tail when necessary, and be sure to grab near the base of the tail. Then put your other hand underneath to support its weight. Chinchillas need plenty of time outside their cage to run around. Supervise them at all times: block any small openings that your chin could crawl into (e.g., under or behind furniture) and remove anything breakable or dangerous. Remember that chinchillas are nocturnal, and may only be interested in playing in the evening. Chinchillas can be trained to use a liter box and can be trained to go back in their cage upon demand. Sickness Chinchillas can live for fifteen to twenty years with proper care. So to keep your chin healthy, it is important to recognize signs of illness and learn how to treat them. A veterinarian specializing in small mammals or exotic pets will be the best source of health information for you pet, but here are a few common problems you may run in to.